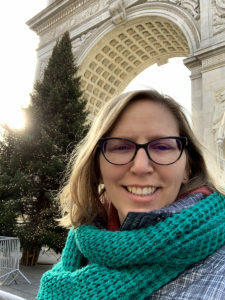 Congratulations to Art History doctoral candidate Michelle Demeter, who begins 2019 as the new Head of Instruction and Undergraduate Services at New York University Libraries. Michelle received her MA in Religious Studies from the University of South Florida, and her MS in Library and Information Studies at Florida State University. Most recently, she served as associate director of Undergraduate Services and coordinator of Engagement and Distance Services for FSU Libraries. She co-authored Library Programming Made Easy: A Practical Guide for Librarians, to be published in May 2019 by Rowman & Littlefield, and contributed a chapter, “Advancing an Optimistic Technological Narrative in an Age of Skepticism: General Electric and Walt Disney’s Progressland at the 1964–1965 New York World’s Fair,” to World’s Fairs in the Era of the Cold War: Science, Technology, and the Culture of Progress, forthcoming in October 2019 from University of Pittsburgh Press. Michelle’s research areas in art history include artistic contributions to world’s fairs and amusement parks, the influence of technology on American visual culture, and the impact of world’s fairs and amusement parks on American historical narratives. She is writing her dissertation under the direction of Dr. Robert Neuman on the 1964–65 New York World’s Fair and the visual and cultural contributions of Walt Disney and his Imagineers.